Electric Motor Sales has a full range of pool cleaners in stock. We can supply or source a pool cleaner to suit your needs. Not sure which pool cleaner to select? Just ask! Below is a sample of what we have can supply. Please contact us if what you require is not listed. 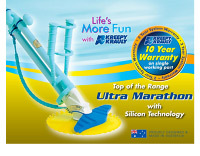 The Kreepy Krauly Ultra Marathon incorporates new silicone technology in the seal flow valve for even longer life and an extended warranty. The unique four-way function forms The Marathon's unique cleaning action. The high efficiency scoop concentrates the water flow in a single stream to ensure maximum vacuuming power. The unrestricted flow cannot put pressure on your pump like many other cleaners. The Marathon is incredibly reliable because it only uses one moving part. Features a silicone suction seal for even longer life, a special roller bumper strap and a 3 Year System Warranty. The Marathon is made in Australia using exceptionally durable material to withstand the most extreme conditions. It comes with a complete 2 year full system warranty, plus a 10 year warranty on its only operational moving part. 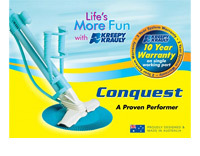 Kreepy Krauly 'Conquest' is a proven performer in many types of pools. With it's random pattern coverage that cleans the entire pool perfectly there will be no missed spots. Wings on each side of the main body channel leaves, dirt and debris directly to your skimmer basket for easy removal. The flexible pleated seal is bacteria resistant to prevent staining or algae growth. The complete Conquest system also features Autoskim to provide automatic surface skimming and carries a two year warranty, available through a network of authorised dealer poolshops and builders. Conquest is a low cost highly efficient alternative to the top of the range Marathon. 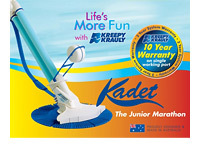 Kreepy Krauly Kadet System is a junior model 'Genuine' Kreepy Krauly. The system features many of the unique benefits of its larger cousins, the Kreepy Krauly Marathon and Conquest. The Autoskim valve / plate combination provides powerful surface skimming to remove all floating leaves and debris. Kadet comes complete with the automatic vacuum control valve "miniskim" which will deliver the perfect amount of suction to the "Kadet" whilst providing surface skimming. For the ultimate in surface skimming for those pools with large amounts of surface debris, the optional "Autoskim" can be easily fitted. The wide mouthed suction scoop provides maximum pick up velocity ensuring all debris is completely and efficiently vacuumed into the skimmer basket for easy removal. 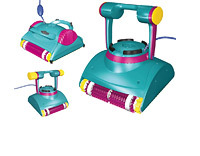 The Klever Kleena is the ultimate in compact automatic pool cleaning systems. Its compact size means it can get into nooks and crannies in all types of pools and will never get stuck. Unlike some pool cleaners, The Klever Kleena is programmed to automatically maneuver around all obstacles so you can just install and forget it. It does all the hard work for you. 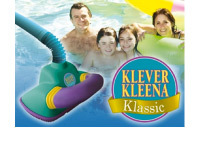 The Klever Kleena will clean your pool quickly and quietly. As it has fewer working parts (no nuts, bolts or screws) than all other geared cleaners, the Klever Kleena will give you years of reliable service and comes with a full 2 year guarantee. The "Autoskim" surface skimmer is an optional extra with this cleaner. The remote unit has multiple settings – Manual operation, Floor only, Walls only or – Turbo Clean for an extra fast clean. Precision engineered for long life, the Pool Pirana's super efficient design and single working part eliminates the need for costly repairs. Pool Pirana can be installed in minutes without the need for tools or special fittings. It comes with a regulator valve, hose, connector and other accessories for easy connection to all pool filter systems. The miniskim regulating valve allows for simultaneous surface skimming and adjusts the cleaner suction for the maximum cleaning performance. 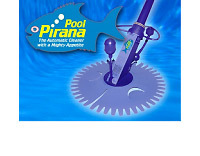 Only Pool Pirana offers a flow-thru vacuum seal that provides a superior dirt lifting function. This and other unique features like the three-way bumper and roller system, combine to deliver a highly efficient pool cleaning action. pump filters the water, is perfectly safe to swim with, costs nothing to run, saves you time and, reduces the need for expensive chemicals. Pool Pirana is so reliable it is performance and defect guaranteed for two years.